The Breakthrough Mind-Body Healing Program by Kathryn Shafer, Ph.D.
Asthma knows no geographical, gender, age and economic boundaries. It effects 15 million Americans across all demographic groups, including children, as well as millions of others around the world. Asthma is the leading cause of visits to doctors’ offices. It accounts for more absences from work and school than any other chronic disease and is the sixth most common reason for hospitalization. Now act so as to transform those life situations that suppress and suffocate. The F.U.N. acronym is no accident. Humor and laughter are essential to the program as are the techniques of mental imagery. With F.U.N., asthmatics learn to recognize the emotional meaning and belief systems at the root of their symptoms and eventually make sense of the suffering that seemed random. “Asthma Free in 21 Days,”chronicles Shafer’s own healing process using the F.U.N. program as well as the patients she healed of asthma at her Limitless Health Potentials therapeutic center in Jupiter, Florida and in workshops across the country. The book clearly explains Shafer’s step by step 21 day F.U.N. program. It also presents research on childhood asthma and suggestions on how kids can use the F.U.N. program. The F.U.N. program is flexible and adaptive and aimed at making asthma sufferers their own primary care providers. 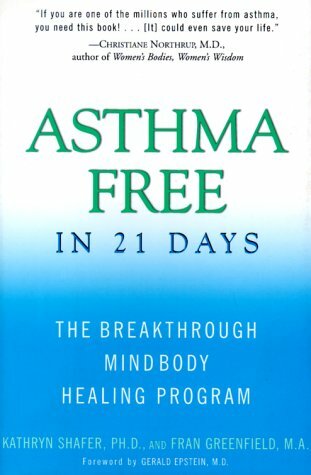 In its holistic view of disease and its cure, “Asthma Free in 21 Days” offers principles and techniques that can apply to many disorders. For asthmatics, the book charts a path to lessening and eliminating dependence on drugs and outside devices. Asthmatics can live not only symptom free, but asthma-free – forever.